Posted on Thu, Mar 1, 2012 : 5:12 p.m. These red racks will disappear from most of Meijer's 199 stores across five states. 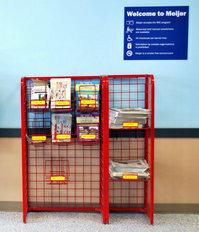 Meijer stores across the Midwest today are eliminating the racks filled with free publications located near most store entrances, according to an MLive report. “Meijer made a corporate decision to remove all the racks in order to maintain a clean, consistent look in the front of our stores, which was not currently the case at most of our locations,” Meijer spokesman Frank Guglielmi said. The racks will remain in Lansing and Detroit area stores until March 15 after concern over their removal was expressed by free publications in those communities. Meijer, which is based near Grand Rapids, operates 199 stores in the Midwest. I think Meijers should rethink this issue. The free publications that they allowed to be in their stores were equivalent to the junk they used to put in newspapers that everyone would throw out. There is still a demand for publications like Wheeler Dealer and Auto Trader. They need to allow free local publications as well. It might attract customers just for that reason. Fri, Mar 2, 2012 : 9:40 p.m.
That's not even news for the employee break room. Fri, Mar 2, 2012 : 9:16 p.m.
Last fall, my neighbor raked the leaves in his yard to spruce up the place. Why didn't annarbor.com run an article about him? Fri, Mar 2, 2012 : 2:17 p.m.
Fri, Mar 2, 2012 : 2:59 a.m.
Nobody reads Auto Trader anymore, unless your name is Joe Dirte. Thu, Mar 1, 2012 : 11:34 p.m.
Good move Meijer. Employees end up taking care of that stuff and it junks up the look of the store. Leave that stuff to Wal-Mart...at least in the Ypsi area since that Wal-Mart is a piece of trash. Thu, Mar 1, 2012 : 11:01 p.m.
That is a good thing less stuff going into landfills.